The screen froze as yet another announcement crept into the cabin from the overhead speakers and through my headphones. I swore beneath my breath. For the umpteenth time, the captain spoke with that strange in-flight inaudibility and cadence: with muffled, static-beleaguered, electronic ums and ahs…followed by a stream of very important ‘nothing-in-particular-I-wanted-to-hear’, and then a curt ‘thank you very much.’ I didn’t need the captain’s announcement to realize my seven-hour journey was now coming to an end, and that we were at last descending into Frankfurt. All I really wanted at that moment was a few uninterrupted minutes to finish the movie I was watching – to follow it through to its remarkable conclusion. To exhale. An older hostess began retrieving the headphones down my aisle, nodding and smiling as she ringed her steady arm with the things. Thankfully, I was prepared: I was wearing my own headset. As our plane hit the tarmac, the credits began to roll on the movie – Jordan Peele’s directorial debut, “Get Out”, an exhilarating, nerve-racking and gruesome examination of racism in the United States. In the movie, a young black man soon finds that his white girlfriend – and her family – are not what they seem to be. What initially comes across as a ‘guess-who’s-coming-to-dinner’ film, dialled up to dizzying levels of awkwardness by its inter-racial subtext, very quickly becomes a satirical treatise on culture and the displacement of black bodies by white people. I won’t give too much away (since it is now considered proper ethics to forewarn one’s readers about movie details), except to say watching Peele’s psychological genre-warping thriller felt like someone had scooped out my innards and filleted me, leaving me barely sentient enough to watch someone else gleefully enter into my skin. So while I was satisfied that I had finished the movie just in time for debarkation, I was acutely aware that I was very likely the only black person on the plane. Being a frequent flyer, I am quite used to being the phenotypic outlier on-board or at the airport. I have been pulled aside too many times to count – you know, ‘for random screenings.’ I have watched as a hostess offered everyone else the choice between ‘chicken’ and ‘veg meal’ – only to arrive at my seat with the question: ‘chicken?’ During a layover after a flight from Sao Paulo to Abu Dhabi, turbaned officials flagged my passport and escorted me from the gate to a special screening area. They wore blue gloves and whispered to each other as they ordered me to open my hand luggage. Nothing I said – neither disclosures of my professional identity and the fact that I was in Brazil for a conference nor my frantic questions about why they had singled me out – could disturb their impenetrably officious scowl. When they were done not finding anything incriminating, they told me that I had better run to the gate. ‘Or your flight will leave you behind,’ the man with the walkie-talkie said, quite matter-of-factly, and without a hint of an apology on his face. So I learned the unwritten rules for safe passage very quickly: I learned to smile even when there was no real occasion for it. I learned to hide my passport…to conceal its green barefaced surface until there was an absolute need to disclose its details. And sometimes, as I later came to see, a quasi-American or British-sounding accent helped move things along. Arriving at Frankfurt’s stoic airport, after being treated to Peele’s gripping vision of racism, I felt the emotional need for ‘friendlier’ faces. Up ahead, at the mouth of the jet bridge, a black official in a smart suit notified transiting guests about changes to their gates. I could tell he was Nigerian. From my tribe, the Yoruba people. Since I was actually on my way to The Hague, I walked to him, but really just wanted to say hello. We greeted each other. It felt cordial, warm and familiar – like it must have felt for the protagonist in ‘Get Out’ when he noticed another black man at his girlfriend’s family’s picnic. All was fine and dandy until I got to the passport lines. When it came to my turn, I presented my passport to two uniformed German officials. The female official seemed to be an understudy of the male one. He was opening the pages of my passport, speaking to his partner in German as he examined my document. Previously, the persons in front of me had walked away after one or two minutes of interactions – but me? Nope. I had to be the one – once again – to stand perilously at the edge of a country as if I was begging to be let in. After what felt like ages just standing in front of them, I said: “Must be an interesting lecture.” The male official replied, “Yes, it is actually!” And continued speaking to his nodding companion in German while I just stood there. “But I didn’t ask to be in attendance, you know,” I continued, as he handed me back my passport. Many tiring steps ahead, I got to security. I knew the drill. Remove your laptop. Any liquids? Remove that too. Place all metal objects in the tray. Remove your belt (I never travel with one anyway). Wait your turn. I still had my watch on. Many airports I had flown through didn’t require that you remove your watch, so I asked an attending official about this – just to be sure. She said it was okay and I joined the line snaking up to the full-body scanner. I did as I was told. Raised my hands. Spread my feet. Then walked out of the whirring tube. The man who had asked me to come out stopped me, gestured to me to come closer to him, and then spoke German to me with a frown on his face. Even though I spent the first years of my life growing up in Bonn – a few hundred kilometres from Frankfurt – I don’t speak a word of German. And there was nothing on me or about me to give the impression that I do. “Excuse me?” I said, bewildered. He didn’t relent. At this point he was some mere inches away from kissing me. He pointed at my watch and spoke more furious German. It was beginning to feel like I had taken the quantum leap and possessed an old white man’s body. And then in clear English, he said, “This is Germany. When you come here, you should state clearly that you don’t speak German.” I didn’t know what to say; I stumbled for words and found the ones I had previously employed. “Um…you want me to take my watch off?” I took my watch off. He simply took it from me and then handed it back to me peremptorily, and then waved me away. Now I cannot say that any of these incidences – or any of the many occasions I have felt mistreated – was a matter of racial profiling. And it would be remiss of me not to mention that I have also been the recipient of just as many gifts of hospitality as a creature of airport terminals – such as I am – might hope for. There’s always another story. Perhaps that hostess who seemed to ‘lock me’ into the ‘chicken’ category had met many other African travellers who almost always went for the non-veg option. Just like me. Perhaps the tutoring duo who were content with me smiling outside their booth while they acquainted themselves with the intricacies of ‘third world’ travel documents were doing me a service – one I could not recognize because they spoke a different language. And perhaps the grouchy official who seemed like he was the last guardian of Aryan boundaries was simply having a bad day. Maybe his dog died that morning. Or he finished having his ritualistic cup of tea only to find a piece of gum stuck at the bottom of the cup. Or he lost his wallet. None of these are trivial. The point is, I knew how to think diffractively. I understood that in the selfsame moment we dehumanize others, we lose a part of ourselves. I considered myself a feminist holder of the manifold, and had long dedicated my work to the nurturance of difference. I taught cross-cultural psychology in a Christian university and, at one point, helped some of my students break through their strong feelings against members of LGBTQ communities (one of my students would later write to me that even though she got an ‘F’, she considered her participation in my class to be more rewarding than if she merely got an ‘A’ and didn’t meet the shadows of her own beliefs). No one who knew me would associate me with prejudice, let alone racism. I knew that even evil has a story, a pedigree, and does not emerge without history or provocation or precedence, but only comes to be known as ‘evil’ in the vortices of the essentializing gaze. One might say I was quite along in my studies of an entangled world, in my appreciation of colonial matters, and in a sophisticated analysis of these things. What’s more? I had only just finished writing a book of letters to my daughter that included my musings about racism, about blackness, about white normativity and the folly of thinking about racism as if it were some native sin that zombified white people. I had written about these things. I had given keynotes on these matters. And often waxed poetic about some approaching world where hatred would be a thing of the past. But in spite of all I thought was second nature to me, I found myself experiencing a most sincere, albeit momentary, repugnance for ‘white people’. Right there in that terminal, floating past blurry lives, following arrows and avoiding gum on the floor, my body trembled in the contemplation of all that had just transpired. How utterly resolute my damnation was. Those poor women of medieval times…the ones suspected of sorcery and witchcraft, whose captors devised the most sadistic mechanisms to acquit or indict them (Toss them in the river. If they float, they are witches and must be drowned. If they drown, then they are innocent. Damned if you; damned if you don’t), suddenly felt like kith and kin – co-subjects of a most unjust state of affairs. What I felt was a carnal anger, with a feral sense of my own mortality and dispensability reflected back to me from the black eyes of my killer. I felt used and violated. Pushed against a wall. Somehow the potent combinatory effects of watching a movie about black bodies being auctioned and used by aging white women and men, meeting immigration officials who didn’t seem charitable or welcoming, and plane food (?) opened the floodgates of an emotion that seemed greater than me and more valid than my intellectual counterpoints. Sulking on the travellator and sliding past sizzling frankfurters, a strolling elderly couple, and the smiling portrait of a blonde woman saying ‘Welcome’ in many languages, I met myself as if for the first time. The moral lapel pin that was stuck to me, that made me ‘one of the good ones’, fell away. I called my wife and told her how I felt. “I hate white people,” I blurted. I had reached a tipping point. I wanted an exorcism. I felt the weight of everything I had lost – my language, my connections to place, my dignity, our own visions of the sacred, and everything that might-have-been – and found the villain who took them all away. My wife…she spoke soothing words, reminding me that I really didn’t hate white people, and that I shouldn’t let it get to me. And yet the pox churned, doing its corroding work on me, exciting my moral boundaries, converting the straight lines within into rabid, scowling, hateful thoughts. At The Hague, in the amniotic privacy of my hotel room, I would later speak with one of my dear friends, a white man. He would tell me he understands. That not a day goes by that doesn’t see him wishing for a different state of things. He would add, as I knew at some level, that those people I had met were rooted in experiences of their own. These ‘interventions’ were helpful in holding me to the ground, and thawing the iciness of my previous encounters. But it was at that Frankfurt terminal, while on the line leading up to yet another security post, and mashed together with various bodies of different hues, gestures, textures, motives, side-talks and longings that were in turn sedimented from unnameable others, that the first painful erosions of my ‘newfound’ prejudice afforded me a moment to gasp. It came like a stunning realization – with the force of an epiphany, even though it was nothing I hadn’t considered before: I wasn’t one of the good ones. When the Yoruba people greet each other, or want to say that they are in agreement with your words, they say ‘asé’. Many people think saying asé is equal to saying ‘amen’ or ‘so be it’, as Christians do after prayer. But there’s a lot more happening here than the mere granting of consent. Asé is the material performativity of the world, the flow and ebb of all things, the testament of irony that imbues the stuff of the world. As I write in my book, “asé is extraordinarily complex, a polysemic word that ‘does not signify anything particular, yet it invests all things, exists everywhere and as the warrant for all creative activity.’” As such, asé is how things come to be, how things cease to be, and the difference between the twain. 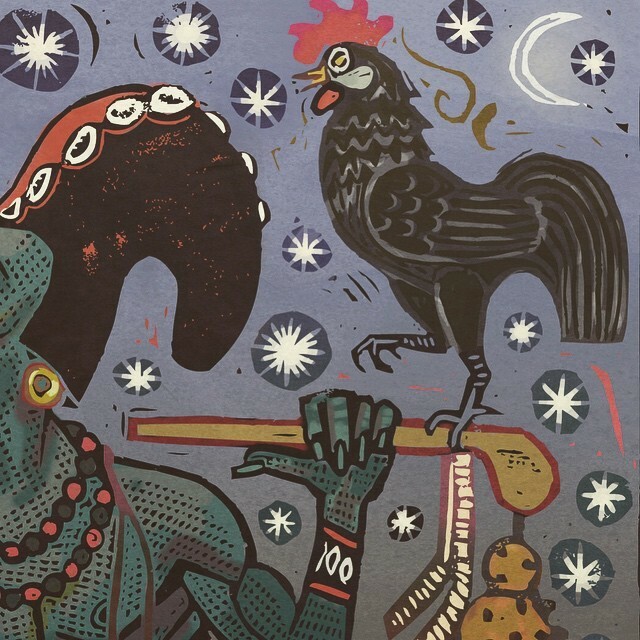 It is thus notable that Yoruba indigenous cosmology describes a pantheon of gods and spirits that are behind the material goings-on in the world – but one in particular who is the custodian of asé. While the most supreme of these gods, Olodumare, is credited with the act of creating the world through the activities of lesser gods, perhaps the most important figure in the pantheon is Èsù – the trickster whose keen ears pick up the prayers of devoted followers at the shrine and takes their entreaties into unspeakable places. Èsù is the corrosive agency that blurs the boundaries between life and death, god and man, soil and sky, good and evil. In short, Èsù spells trouble. He ensures that creation is never complete but is always constantly reiterated. Little wonder Samuel Ajayi Crowther, a slave-turned-clergyman, and translator of the English bible into Yoruba, used Èsù as the name for the devil. Èsù has been associated with Satan ever since – a most unfortunate translation, if you ask me. What’s critical about Èsù and asé is that it is believed they sit at ‘the crossroads’. They are not to be found on the highway or the straight road; they are aspects of intersections and diffractions and intra-actions. When many Africans think of life in terms of a web, they are paying tributes to asé; they are saying that we cannot think of anything as independent from other things. Things derive their ‘thinginess’ from entangling relationships. Reality is a wound that never heals; its edges are constantly excited and bleeding. And emergence never happens in a straight line. To account for a simple object, you must turn away from fixating at its presumed source and scour the length, breadth, heights and depths of its preposterous expansiveness. You must situate said object at the crossroads where the traffic of the manifold congeals into definable, albeit transient, boundaries. A piece of paper is therefore not merely the material manufactured from wood pulp, it is the enfoldment of pregnant clouds and the ensuing regime of raindrops. It is water leaking into dirt and nurturing its ecosystem, leaving petrichor in its wholesome wake. It is the morning rise of the farmer’s wife, the sharpening of his tools, the loan of a bank allowing him to purchase fertilizer, and the toil of their hands to grow a spruce tree. A piece of paper is the microbial yearning of many critters and aborted burrowing of midwife worms. With crossroads, there are no sources, just enchanted fields that disturb the idea of beginnings and endings. The human self ceases to be the reductionist product of Cartesian lore and dissolves into the many and the yet-to-come. We are learning about extended cognition and trans-affectivity: how trauma reincarnates in latter generations even when we suppose it has been resolved; how spider webs are active in the generation of memory and learning; how octopi limbs are self-acting agencies; how brittle stars – lacking a central nervous system and brain – are able to respond intelligently to their environment as if they had one; how an entangled particle, dislocated and separated from its twin, can instantaneously ‘receive’ information about the twin’s changing values over vast distances – as if they were one particle, not two. But more in keeping with the themes of racism and prejudice and elided power that are explored in this essay, the implication of rethinking everything in terms of crossroads or intersections and intra-actions means we have to let go of the notion of absolute power and its corollary, absolute victimhood. Power – which is the concern of asé – does not flow in straight lines, in neat exchanges from us to them. Power, like a stone or a spruce tree or a piece of paper, is fractal – sprinkled everywhere. It is this recognition that is inviting a redescription of many of the martial metaphors we often employ in our activisms – metaphors that make power a simple matter of simple transfers. We cannot ‘fight’ racism or ‘stop’ it – as if it were something neatly extended outside of us. It is not ‘us’ versus ‘them’, since ‘us’ is a function of ‘them’ and vice versa. But more critically, when the sword strikes, it cuts not only the recipient of the blow but also the wielder. Colonial power cannot be accounted for without addressing the many ways the wounds of the blow are shared and the ubiquity of trauma emphasized. Crossroads mean that personhood is multi-nodal and conspiratorial: it might seem like my experience of selfhood teaches me that I am self-contained, independent and relatively permanent, but how I make decisions, the emotive frequencies and signals I pick up on, the passions I exhibit and those I inhibit, ‘my’ thoughts and accomplishments – all of these are the contributory effects of others. If you have a knot on a long piece of thread, the bumpiness of the knot might give the impression that it is on the rope—instead of what the rope is doing. The rope proceeds, wraps itself into a knot, and then carries on from there. We are only selves within the tapestry of a larger self-ing, an intricate bending of branches and boughs, a skirting of river surfaces, the romance of moon and sea, the insurgency of stardust. In this sense, no one is good. No one is evil. Not in the sense we are used to. We are sensuous, large and contradictory. We contain multitudes. We incubate memories that are not our own, secrets engendered in the architecture of our molecules. Being made of crossroads means we are subject to the criss-crossing effects of other forces. It means we are no longer in traffic, but that we are traffic. It means that I have to acknowledge that under different circumstances, I might as well be the ‘racist’, the drunkard, the killer, the capitalist and the dictator that my moral codes seek to distance me from. It means that even working hard at enacting social justice is part of the generativity of a ‘whole’ that includes injustice – and that my so-called solutions are often the same inner working logic of the problems I seek to evade. It means I am not separate from the damnable other. I am not good, and there is no hope of me attaining goodness since that would mean I suddenly become disentangled from the soil of bones and dark death and fossilized scandals and scurrying life and abortions and fibrous successes that nurtures me. And my work cannot be about identifying racism as some pernicious essence that inhabits rednecks, moustachioed colonists or white people. Neither is it about curing myself first or attaining some standard of purity before I engage with the issues I am concerned about. It is about sharing the burden of the crossroads, finding little spaces where I can become a witness (or ‘with-ness’?) with an ally I can trust to hold the salacious, unsavoury and embarrassing aspects of my becoming. That totalizing state of prejudice that forced me to wrap up the ‘racial other’ into simple narrative bits, to avoid the complexities of their heritage, and impose the features of a few on the many – that hatred – was a signal from anonymous intergenerational others I was somehow connected to across time and space. Maybe hatred itself has its ‘origins’ in the evolutionary advantage that comes from quickly knowing whom to confront or scorn. Whatever it was, I wanted to take it to the village square and honour it properly. I wanted to share it with others trusting that I will be listened to, not pre-emptively judged because the subject of hate makes our righteous bones stand straight. I wanted to respond to the burden of the crossroads, to treat those transient feelings as irresolvable visitors that will go someplace else to maybe materialize into an extra tentacle for some unknown creature, or metastasize into a redeeming cancer. I no longer wanted to be fixed – and that freed me up to really consider what racial matterings might look like outside of the vocation to cure the other of his evil racism. Ironically, the burden of the crossroads – which necessarily includes the weight of all things material and all things discursive – is remarkably light. The moment I embraced my dark side, the easier it felt for me to want to share my burden – to pass the inscrutability of a strange emotion down the transcorporeal web so that it might become whatever the web allows it to be. The more readily I befriended the feeling, the more acutely I felt a compassion for those that were the objects of its force. Walking past security, without incident this time, I couldn’t help but wonder how the airport terminal itself was one giant figure for the transience of things – where arrivals become departures, where positions change, and a heap of bodies discipline our stubborn insistence on separation. I suppose my wonderings threw me off course, and I got lost in the massive sprawl of that terminal – because, after walking a good while, I could not find my gate. Shortly, an airport cart approached and I stopped the driver, and asked for gate ‘A-something’ (I can’t remember what number it was). The driver was, of course, white. “Oh,” he said, “you’ve missed your way. It’s that way,” he said, pointing past me in the direction I had come. We drove through the airport. Slowly. Chatting about the fact I actually grew up in Germany, what he wanted for his family, why he did the work he did, and why the Frankfurt airport was atrociously large. He also told me he didn’t get listened to a lot. I looked at my driver as he chatted away, happily oblivious to all the ponderous things that had happened earlier. I imagined him drugging me and stealing my body – like the villains in ‘Get Out’ – and realized that we already inhabited each other’s bodies. And for the rest of the journey, I felt safe. Bayo Akomolafe (Ph.D.) considers his most sacred work to be learning how to be with his daughter and son, Alethea Aanya and Kyah Jayden – and their mother, his wife and “life-nectar”, Ijeoma. “To learn the importance of insignificance” is the way he frames a desire to reacquaint himself with a world that is irretrievably entangled, preposterously alive and completely partial. His first solo book, ‘These Wilds Beyond our Fences: Letters to My Daughter on Humanity’s Search for Home’, comes out Fall 2017. Join Bayo for his online course, ‘We will Dance with Mountains’, this September. Find out more here.